Fruits, Can We Eat Too Many? March 7, 2013 Wallace Bishop I.N.H.C, C.N.C. I love fruits and know they can be incredibly healthy. They are rich of antioxidants, vitamins (except B12 and Vitamin D) and minerals. In addition they contain very healthy and important phytonutrients like antioxidants, malic acid in apples and coumarins in citrus fruits. 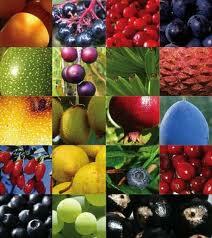 Fruits help prevent aging, and may help prevent many different illnesses and diseases. Plus they taste great! However in this part of the veggie world too much of a good thing can happen. Although sugars have fructose, which doesn’t cause blood sugar spikes, they still contain plenty of sucrose and glucose (like table sugar), which do quickly raise blood sugar levels. Too much sugar can cause hormonal imbalances making it difficult to lose or maintain weight. Sugars, particularly removed from their natural fibers (in the foods) can cause a rapid rise in blood sugar levels, then a rapid decline in blood sugar causing more cravings. In my opinion, berries offer the lowest sugar and biggest nutritional bang for your calorie. Goji berries, blueberries, strawberries, blackberries etc. are super good for us. If you are eating bananas make sure they are green on they tips and bright yellow with no spots. Slightly green bananas have about half the sugar a ripe banana has. Granny smith apples have less sugar than other apples have. Avocados, limes, lemons, grapefruit, papaya, peaches, plums, and berries are the lowest in sugar. While dates, cherries, apples, bananas, pineapple, grapes and mangos are some of the highest. Dried fruits are extremely rich in sugars and should be avoided if you are trying to lose weight. For anyone wanting to lose weight I recommend you consume no more than three (3) servings of fruit per day. And truthfully, I would prefer you only do two (2) servings a day until major progress is made in the weight loss. Of course I do not recommend any fruit juice, it’s just way too much sugar. A serving is one medium fruit (think apple, pear, peach, plum) or 1 cup of smaller fruits like berries. Aim for 3 times more vegetables than fruit in your diet and you will be great. Next Post Chocolate and It’s Healthy Delecious Goodness!